Takes me right back to my childhood. Did you have Easter egg hunts when you were a kid? I hope so. It was such a fun time! 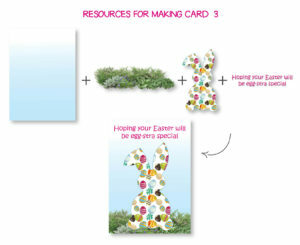 In this tutorial I’ll show you how to make not ONE, but THREE Easter cards. You need a design layout program such as Adobe Indesign, or any of the free layout programs, such as Scribus. You can even create cards in MS Word, or Adobe Photoshop. The first card is square – 7 X 7 inches. Cards 2 and 3 measure 5 X 7 inches. All the clip art, and the backgrounds, are contained in this DROPBOX LINK. 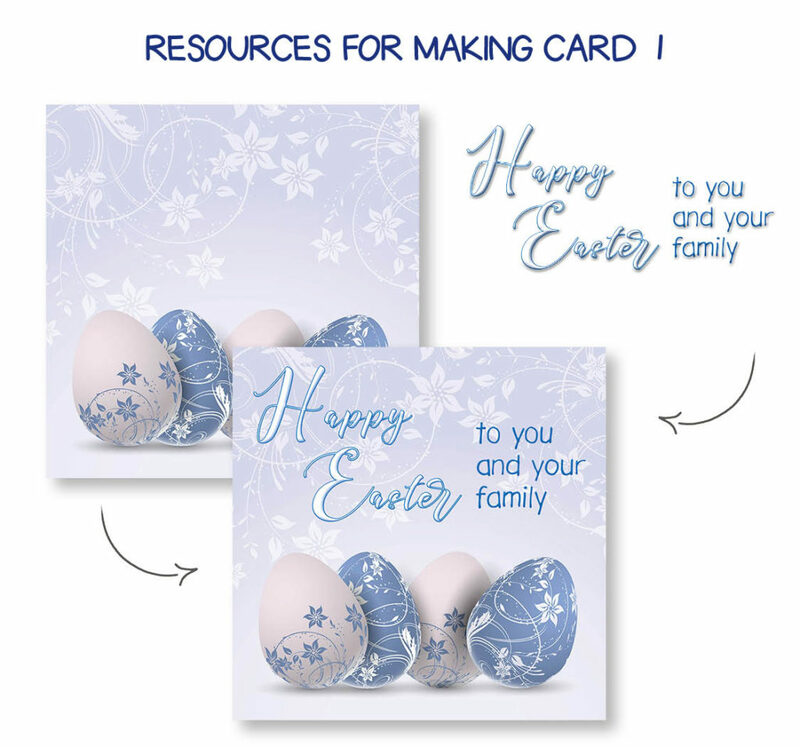 CARD 1: Firstly, open a new document in the design package of your choice. Make the document 7 inches wide and 7 inches high. Drag and drop (or copy and paste) the background for Card 1 (background image credit: www.pngtree.com). It should fit perfectly into your 7 X 7-inch document. Then add the text of your choice. If you want to use the text that I’ve used, it’s included in the Dropbox link. Drag and drop (or copy and paste) the text in place and resize to your liking. Once you’re happy with the size and position of your text, you should create a PDF from the document which makes printing really easy. Either “export” the document to PDF format, or “save as” a PDF, depending on the software you’re using. Print and trim. Alternatively, create a JPEG from your document as this also prints easily, and makes a great eCard (a card sent electronically). Create Cards 2 and 3 in the same way. CARD 2: Create a new document 5 inches wide and 7 inches high. Drag and drop (or copy and paste) the background for Card 2. It should fit perfectly into your 5 X 7-inch document. Drag and drop the yellow Easter egg clip art. Resize it to your liking and position it toward the lower part of the card. Then add the text of your choice. If you want to use the text that I’ve used, it’s included in the Dropbox link. Drag and drop (or copy and paste) the text in place and resize to your liking. Once again, create a PDF or a JPEG for printing. CARD 3: This card is a great one for kids and you can personalize it by adding their name to the text at the top of the card. Create another document 5 inches wide and 7 inches high. Drag and drop (or copy and paste) the background for Card 3. It should fit perfectly into your 5 X 7-inch document. Next, drag and drop the foliage background and place it right at the bottom of the card. Resize the foliage to your liking. 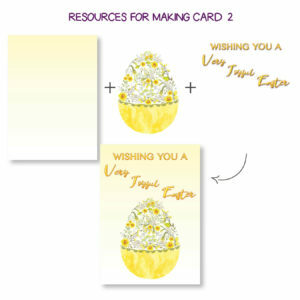 Now drag and drop the Easter bunny and place it toward the lower part of the card (keeping enough space at the top for your text). Add the text of your choice. If you want to use the text that I’ve used, it’s included in the Dropbox link. Drag and drop (or copy and paste) the text in place and resize to your liking. Once again, create a PDF or a JPEG for printing. Have a fun-filled Easter with the little ones in your family. 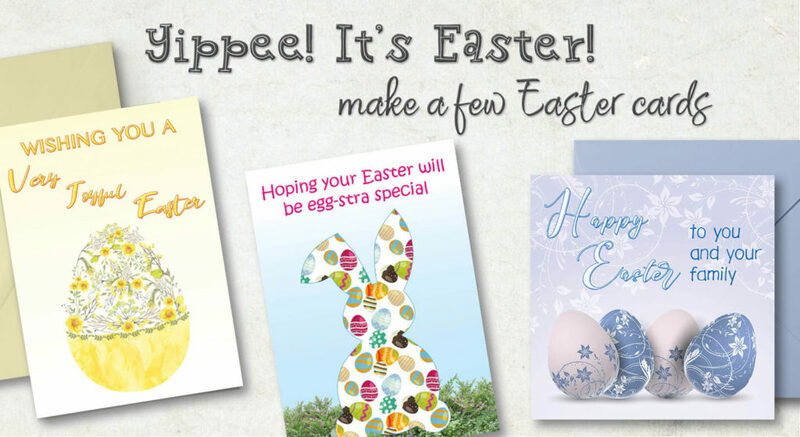 Make it extra special by making them their very own Easter card to add to their stash of Easter eggs. Happy Easter and chat again soon!